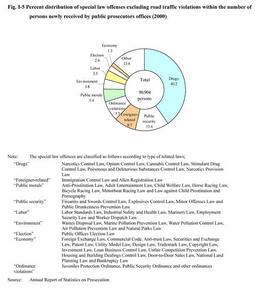 White paper on crime 2001 Part 1/Chap.1/Sec.2/1. By type of offense, the number of persons newly received for Road Traffic Law violations and Vehicle Parking Spaces Law violations (together called "road traffic violations" in this white paper;see NOTES) accounted for 91.2% of the total number of persons newly received by public prosecutors offices for special law offenses and 43.1% of the total number of persons newly received for all offenses including penal code offenses. Road Traffic Law violations do not include violations subject to the traffic violation notification system and for which a non-penal fine has already been paid. Fig. 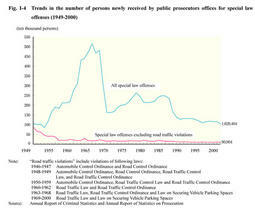 I-4 shows the trends in the total number of persons newly received by public prosecutors offices for all special law offenses and for special law offenses excluding road traffic violations since 1949. The total number of persons newly received for all special law offenses showed a sharp fall after reaching a peak of 5,140,389 in 1965, and has been on a par at between 1 and 1.5 million persons since 1988. The number of persons newly received for special law offenses excluding road traffic violations has been fluctuating between 80,000 and 90,000 since 1992. Fig. I-5 shows the percent distribution of special law offenses for the number of persons newly received by public prosecutors offices in 2000. These special law offenses excluding traffic-related offenses are divided into special law offenses related to drugs, foreigners, public security, public moral, the environment, labor, economy, elections, and others, and violations of ordinances.